On Friday I drove to downtown Los Angeles. I don’t do it very often since moving to Valencia, 50 miles away. I feel fortunate that I live close to a big city that has an ongoing fashion industry. There is a shop called “Hot Iron” that specializes in these steam irons, which are used in design workrooms. I went to get a new water bottle since mine uses the drip system. The lever on the old bottle started leaking after 20 years of turning on and off almost everyday. I love this iron and don’t know what I would be doing without it. 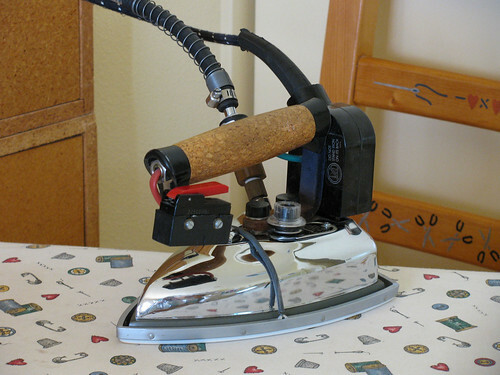 I recommend this type steam iron to anyone who sews, knits, or crochets. One pass and wrinkles disappear. It blocks a sweater in no time (no wetting, though I often pin out the pieces before steaming). You can steam shrink many dry-clean only fabrics including lurex without spotting and it is really hard to burn anything. You don’t have to keep adding water since the bottle holds at least 3 quarts. They last forever, because they can be repaired easily. This type of steam iron makes getting a professional look fast and easy, remember “the finishing makes or brakes an otherwise well constructed item”. This entry was posted on Sunday, November 9th, 2008 at 3:00 am and is filed under Sewing and Tools. Tagged: Iron, Sewing. You can feed this entry. You can leave a response, or trackback from your own site.